naked cricket: The story behind Viru's dismissal. The story behind Viru's dismissal. pity he din't ask gauti not to dance! 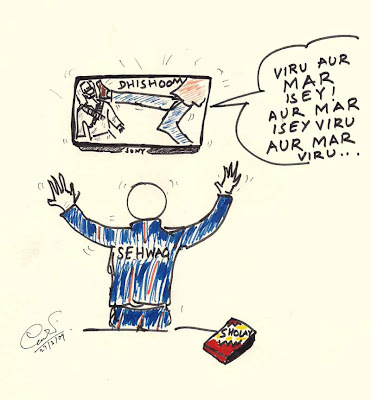 and that's why we lost gauti, dancing down the pitch! I'm simply stumped by Gauti's blind love and affection for Viru! som, they're thick as thieves, the type that love to steal a single. i thought viru could go, gauti, in kutton ke saamne mat nachna..
pity, nz players have been such good hosts, viru couldn't have abused them! this is why i have always believed, india needs hostility to perform well! ankit, either hostility or MSD in tests.